Last week I shared with you how I got served $250 to my new Serve card, a service from American Express, and Verizon. 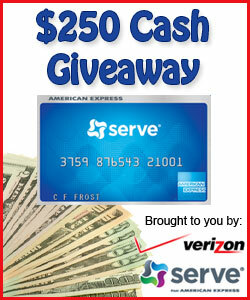 This week we are giving away a Serve card with $250 cash to one lucky fan can load on their new Serve card! Get your own Serve card today! It’s a digital account from American Express that is loaded with awesome features and benefits. You will also receive a $25 account credit when you sign up for a new Serve account and make a one-time load of $25 or more through September 30, 2012. Make your one-time load of $25 or more via a bank account, debit card, credit card or MoneyPak. This is a great partnership from Serve and Verizon. The best part is that there are no credit checks and no monthly or annual fees. I highly suggest this card for parents with kids in college or travel. It’s a great way to send money to them safely and securely. I have used mine for several days now and I love it. The app for my Android phone is awesome because I can quickly check to see how much cash I have left on my card. I used it at for groceries, online, and for gas. When I paid at the pump they did put a pretty hefty hold on part of the cash on the card. Within a few days the cash was available again. I would suggest if you don’t want this to happen you can go in and pay an exact amount for your gas so there will not be a hold. Enter to win $250 to be loaded to your own Serve card on the Rafflecopter entry form below. Giveaway ends October 15, 2012 at 11:59 pm EST. If you win, you must sign up to receive a Serve card. The money will be loaded to it. Good luck everyone! « New Free Samples from Panda Express, John Frieda, Herbal Essence, and More! layaway for the Holidays is a life saver for those of us on a budget! I am glad layaway is back in some stores, at least. I though, like to use a prepaid card like Serve for Christmas shopping to help limit myself. I already have 2 power wheels for my toddlers for Christmas on layaway at Kmart lol. We got my son the Lightning McQueen car and my daughter the Barbie mustang, I can’t wait for Christmas! What a great layaway. Thank you! It is time to start planning for the holidays. Thank you for offering this generous giveaway. Layaway can be nice for those who need it. OH I love layaway for the holidays-I think it’s great for anyone and specially for the ones that live on a strict income-I can say from experience-being in retail at Walmart(15year) and out of those 15 years I used layaway 11 of them-until Walmart corp. decided to do away with it-I can tell you it hurt alot of people and families around the holidays and school time-I’m glad to see that it is being utilized again even if it’s only for the holidays. im thrilled that some stores are bringing layway back, too bad more stores dont follow their lead. the economy is tough right now, parents and others need all the help they can get come holiday season! I like the fact that there is this option for families, I however have not used layawy for years. Well since walmart stopped years back. I always think about the holiday programs, then just never get around to it because I live so far out in the country I would hate to not get the payment made or make a drive just to make that payment. With money being tight I simply have just started finding great deals online and tae advantage of companys that offer free shipping. Layaway helps because you don’t have to buy alot of things to go to the layaway line. This would be great for a layaway for the holidays!!! I sure could use this,for grocs, GOD BLESS AND KEEP YA’LL SAFE IN HIS LOVING ARMS. I have used layaway for years. It has been my lifesaver. Layaway is a good payment alternative for those that live week to week. I hate doing the layaway thing. It cost extra money and that is one thing I do not have. YA! I used to use lay away long ago- but now I have to be careful and not go over board! LOL but it is nice to grab something on sale when you are there and just can’t buy it that very day! Layaway helps you make sure, with regular payments, that there will be presents for Christmas under the tree! Loving that so many places have Layaway! Kmart’s looks much better than other places’s layaways! layaway for any time of the year would be great. This is a convenient shopping option and lets you have a better chance of getting popular items by shopping early. Layaway can be dangerous for some people! I have used layaway very seldom, but it can be a very good method for buying items–still have to be careful though, because each store does have its own rules about the process. I use to use layaway a lot for Christmas gifts when my children were little. It saved money to purchase the toys when they were on sale and then pay for them on layaway each week. Layaway is a great thing for people who need time to pay for certain gifts. My mother used it all the time. could use this to get some gifts ty.